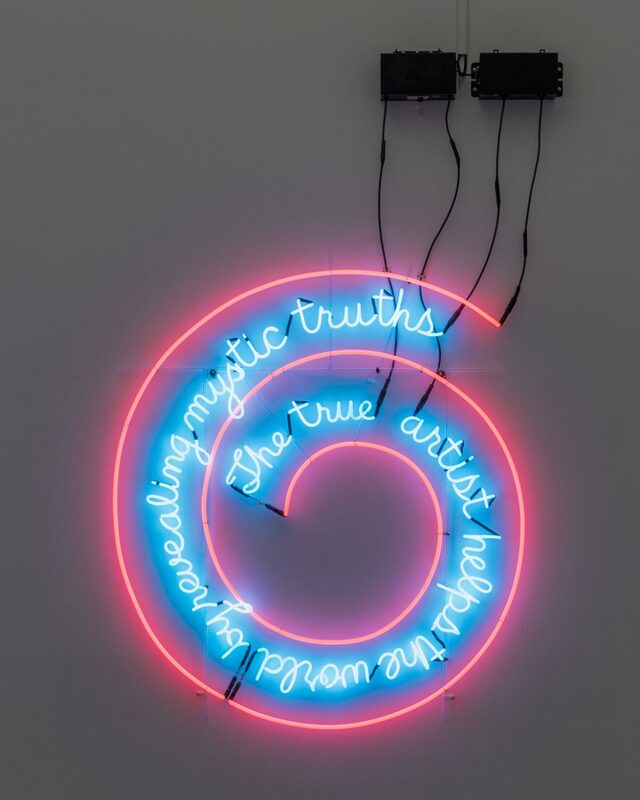 The True Artist Helps the World by Revealing Mystic Truths (Window or Wall Sign), one of Nauman’s first neons, is a founding work in his career. Hijacking a medium generally associated with the tawdry (cheap motels, shop windows, and bars), Nauman's sign advertises a metaphysical and deeply personal message as if it were for sale. Throughout his long and illustrious career, Nauman has examined the role and responsibilities of the artist. The title statement of this poetic spiral is neither entirely facetious nor completely serious, and the contradictions embodied in the piece yield an ambiguity that is both playful and profound. Bruce Nauman has applied his maverick use of mediums—including photography, neon, film and video, installation, drawing, printmaking, and sculpture—to his conceptual and often paradoxical works that evoke the equivocal nature of language and the physical limits of the body. One of his earliest works, Window or Wall Sign is also one of his most provocative and enduring. In 1967 Nauman recently had completed his MFA at the University of California, Davis, and established his first studio in a former street-front grocery store in San Francisco. A neon beer sign still functioning in the market’s window—a relic of the space’s former mercantile capacity—propelled Nauman to produce his own public statement about the personal practice of artmaking. He hung his sign facing the street, where it both blended in with the commercial elements of the cityscape and piqued the curiosity of perceptive passersby. However, the boldness of Nauman’s declaration expertly belies its interrogation into the role of the artist in society. Positioned in a place of public consumption, Window or Wall Sign asks its reader to participate in determining the validity of its statement, which is at once profound and quixotic, forward and facetious, lofty and self-aware. Nauman has continued to work with neon throughout much of his career, most intensely in the 1980s, often creating word-based signs in which the tensions between medium and language are in continuous play. Erica Battle from, Philadelphia Museum of Art: Handbook. Philadelphia: Philadelphia Museum of Art, 2014, pp. 370–371. Over the past four decades, Bruce Nauman has become a cornerstone of contemporary artistic practice through his maverick use of mediums--encompassing photography, neon, film and video, installation, drawing, sculpture, and printmaking--and his continual investigation into often paradoxical and conceptual uses of language and the body. In 1967, Nauman had recently completed his MFA at the University of California, Davis, and was newly cast into the world as young artist pondering his role in society. A relic of his San Francisco street-level studio's former capacity as a grocery store-a still-functioning neon beer sign-propelled Nauman's creation of this seminal Window or Wall Sign, which he hung in the window facing the street. By commandeering the commercial medium of neon for an artist statement, Nauman both proclaims the importance of the "true artist's" role and implies its inherent quixotic ambition. At once forward and facetious, lofty and self-aware, Window or Wall Sign asks its reader to participate in determining the validity of its declaration. Erica Battle, from Philadelphia Museum of Art: Handbook of the Collections, 2009.